I was in a swap on another site that just finished and for it I got to make up a package based on the movie Labyrinth. Which I was deliriously happy about because it gave me a reason to make this. The Goblin King in all his glory. 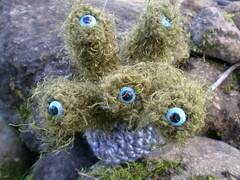 The other fun thing I made was some of the eye lichen. This specimen was pried from a decaying section of wall near the northern edge of the Bog of Eternal Stench. The particular wall lies downwind and is seldom visited, for obvious reasons, especially by the repair-crew goblins. There has been a longstanding belief that the eye lichen only grows on the southern sides of walls and that at sundown all the lichen in the Labyrinth collectively looks towards the castle. Regional variations on the belief state the lichen looks towards the exit, and occasionally, lunchward. This is clearly false and has led many travelers farther astray. Of course it’s their own fault for believing such a stupid thing when clearly the lichen never looks collectively at anything. Here's the rest of the Labyrinth photos on flickr http://www.flickr.com/photos/[email protected]/sets/72157617064703397/ there's lots more of Jareth. I had such a blast making this stuff. I had to share. ETA There's no pattern at the moment. I took some notes as I worked but I left a lot out, I'm planning to make a Jareth for my very own eventually so hopefully I'll flesh out the notes then and try and put them into a format that other people could actually read (my brain works in weird ways). But it's not gonna happen soon. Too much other stuff to work on. Awesome. Labyrinth must be in the air. The project I started today is labyrinth inspired. Great Job! 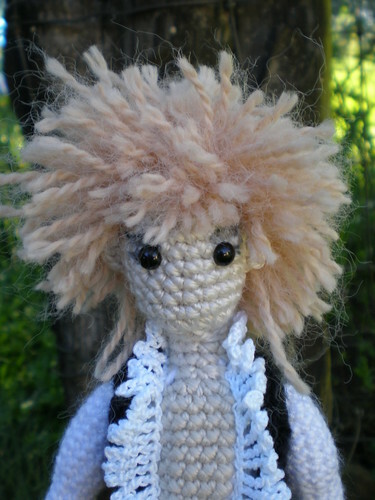 Best Jareth crochet doll I have seen. i'd know that codpiece anywhere! i even knew who/what it was from the front page thumbnail! i'd know that codpiece anywhere! Ha! that's awesome aada! I really wanted him to have that particular feature, it seemed important. Seeing as how pretty much any time there is a conversation about Labyrinth it eventually turns to Bowies crotch. Not including it seemed like it would be wrong. It did seem a little weird at the time to be contemplating how to shape his junk. But it just paid off. Awesome! 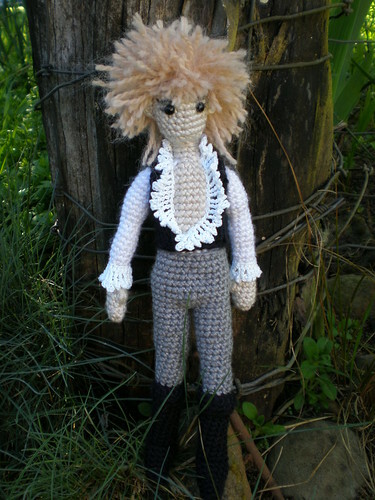 I want a Jareth doll to cuddle. Definite thumbs up on the crotch! I immediately knew who he was when I saw the thumbnail on the main page! He is so cute! And I love his crotch. I'm very thrilled that you included it, as it really IS vital. And it looks fantastic. "I really prefer burning a whole house down rather than trying to root out a few rats. It's extreme, but y'know, I'm not a very nice person." I love your Jareth doll! And your attention for every detail, LOL.